We already knew about Venus. We had our suspicions about Mars. Now we’re sure. Our two closest solar system neighbors once had oceans – planet-encircling, globe-girdling, Earth-like oceans. But waterbearing planets are fragile. Venus didn’t have the right stuff and lost her oceans to space. We have the smoking gun. And now we know that Mars, also, poor Mars, couldn’t hold on. Mars has lost to space at least 80% of all the water it once had. Et tu, Earth? What about you? More to the point, what about us? 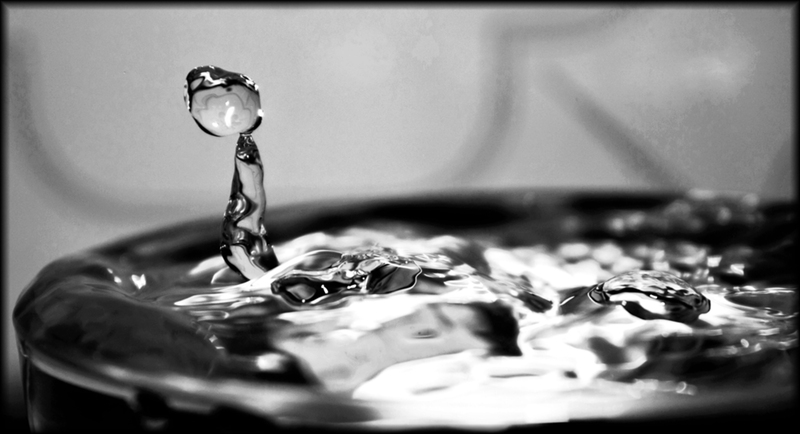 Despite water’s apparent abundance, what does the future hold for the most precious material on our planet? Will we find a way to mistreat our reserve of irreplaceable water and turn our planet into a planetary desert, like our neighbors Venus and Mars? Kick the temperature up a few more notches, thanks to a runaway greenhouse effect, and the ultimate consequence of global warming could be ejecting the water from our planet. Two H’s and an O make a water molecule. Let’s try our hand at interplanetary forensics. First, let me introduce you to the atomic constituents of that substance chemists call H2O, which most of us more commonly know as water. The H represents the atom hydrogen. The O represents the atom oxygen. 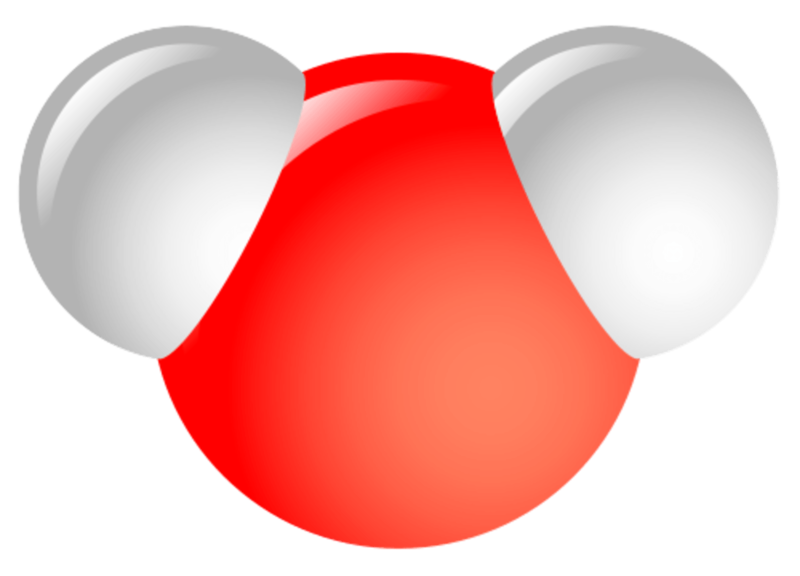 The number two after the letter H tells us that a single molecule of water is composed of two hydrogen atoms and one oxygen atom. 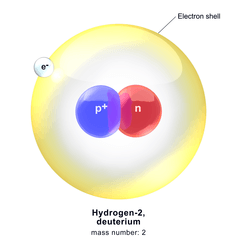 Deuterium is hydrogen but with an extra uncharged neutron. In order to enter the world of CSI: Solar System, we need to understand the structure of atoms in a bit more detail. Hydrogen is hydrogen because its nucleus has one positively charged proton, which is orbited by one negatively charged electron. The nucleus, however, can also include one neutron, which lacks a charge. Even with one neutron, the atom still has a positive charge in the nucleus of +1. It’s therefore still hydrogen, but with one critical difference: it is much heavier, about twice as heavy, in fact, thanks to the additional neutron. Chemists call this kind of heavy hydrogen deuterium. Deuterium behaves identically in chemical reactions to regular hydrogen; it’s just heavier. Remember that H2O molecule? When made with a deuterium atom, it’s an HDO molecule. It would taste the same, and it would provide the same sustenance to your flowers and gerbils, but it would weigh more. That extra weight makes all the difference, because Isaac Newton’s and Albert Einstein’s unavoidable law of gravity says that deuterium is pulled downward toward the surface of a planet much more strongly than is regular hydrogen. When deuterium and regular hydrogen are both free to bounce around in a planet’s atmosphere, the regular hydrogen will bounce much higher. And if the planet’s gravity is weak enough – which is the case for Earth, Venus and Mars – regular hydrogen can bounce so high that it can escape into space, whereas the deuterium remains forever bound by gravity to the planet. Galileo’s probe lasted less than an hour before being destroyed by Jupiter’s atmosphere. In 1995, NASA’s Galileo probe measured the ratio of hydrogen to deuterium in the atmosphere of the giant planet Jupiter and found that ratio to be about 40,000-to-1. Jupiter is such a massive planet that neither hydrogen nor deuterium can escape. Consequently, planetary scientists are quite certain that all the materials involved in the mixture of gases and dust that formed the sun and all the planets in our solar system formed with the same ratio of hydrogen to deuterium as the Galileo probe found for Jupiter’s atmosphere. We take it as a given that all the water originally deposited on Venus, on Earth, and on Mars also had that same ratio of hydrogen to deuterium. Now let’s do some chemistry. If I wanted to make 20,000 water molecules, I would need a total of 40,000 hydrogen (H) and deuterium (D) atoms (of which 39,999 would be H and 1 would be D), plus, of course, 20,000 oxygen (O) atoms. In my mixture of 20,000 water molecules, I would be able to make 19,999 H2O molecules and one HDO molecule, given my initial ratio of hydrogen to deuterium atoms. Still more H than D, but less than you might think…. In a cup of water scooped from any part of any of Earth’s oceans, in any local freshwater pond from any continent, in any cup of tea in any city, in an Alpine glacier or a hot spring in Yellowstone, the hydrogen-to-deuterium ratio is 6,250-to-1, not 40,000-to-1. Why so low? The evidence suggests that early in Earth’s history, our planet lost a great deal of hydrogen (but not deuterium). As the hydrogen atoms escaped to space, the H-to-D ratio would have dropped from 40,000-to-1 to only 6,250-to-1. In fact, the Earth may have lost as much as 80% of its original population of hydrogen atoms, and since, on Earth, most hydrogen atoms are bound into water molecules, the loss of hydrogen atoms is likely equivalent to the loss of water. 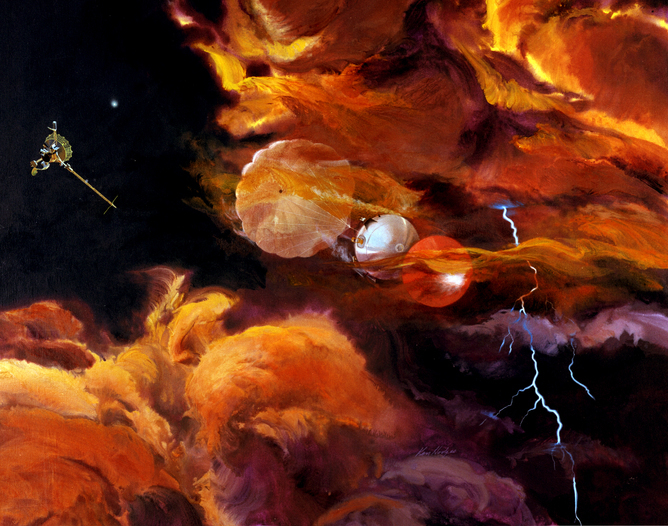 An atmospheric probe descends through the Venusian cloud deck. NASA’s Pioneer Venus spacecraft, way back in 1978, dropped a probe that parachuted into and measured the properties of Venus’ atmosphere. 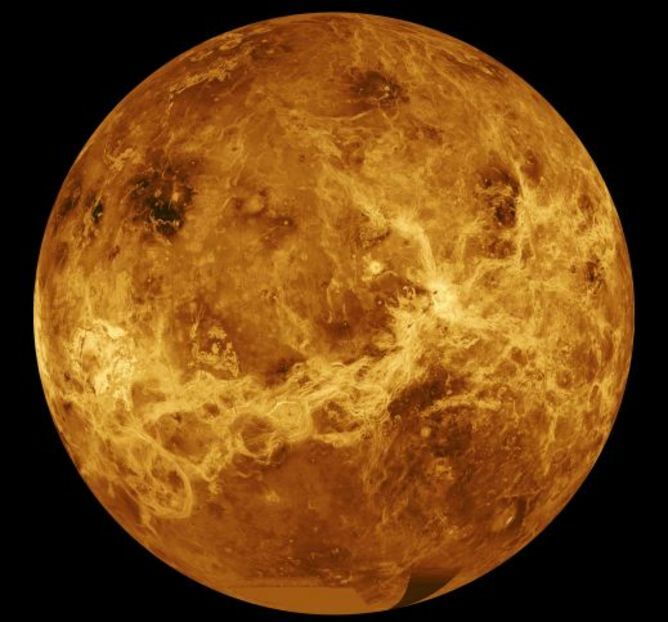 One of its shocking discoveries was that the hydrogen-to-deuterium ratio on Venus is only 62-to-1, fully 100 times smaller than the ratio on Earth. The clear implication of this discovery is that Venus was once wet but is now bone-dry. Venus, as we now know, has a surface temperature of 867 Fahrenheit (463 Celsius). Venus once had oceans, but Venus warmed up and the oceans boiled off the surface. Then ultraviolet light from the sun split the water molecules apart into their constituent atoms. As a result, the lighter hydrogen atoms bubbled up to the top of the atmosphere and escaped into space, while the heavier deuterium atoms were trapped by Venus’ gravitational pull. The hydrogen-to-deuterium ratio in Venus’ atmosphere is the crucial clue that provides the evidence for what happened a billion or more years ago on Venus. Mars looks pretty dry now, but mineral veins were deposited by fluids moving through rock. Now, in research just published in Science this spring, a team of scientists led by G L Villanueva of NASA Goddard Space Flight Center has used powerful telescopes on Earth to map water (H2O) and its deuterated form (HDO) across the surface of Mars. They’ve confirmed the results obtained by NASA’s Curiosity/Mars Science Laboratory in 2013 that the hydrogen-to-deuterium ratio on Mars is smaller by a factor of about 7 compared to that on Earth. This measurement tells us that Mars, like Venus, has lost lots of hydrogen, which means Mars, like Venus, has lost lots of its water. Is Venus’ present Earth’s future? Whither goest Venus and Mars…. Venus and Mars. Mars and Venus. Planetary scientists know that both planets were wet and Earth-like in the beginning; they also know that neither Venus nor Mars could hold onto their water for long enough to nurture advanced life forms until they could flourish. The lessons from Venus and Mars are clear and simple: water worlds are delicate and fragile. Water worlds that can survive the ravages of aging, whether natural or inflicted by their inhabitants – and can nurture and sustain life over the long term – are rare and precious. If we allow the temperature of our planet to rise a degree or two, we may survive it as a minor environmental catastrophe. But beyond a few degrees, do we know the point at which global warming sends our atmosphere into a runaway death spiral, turning Earth into Venus? We know what the endgame looks like. David A Weintraub is Professor of Astronomy at Vanderbilt University.